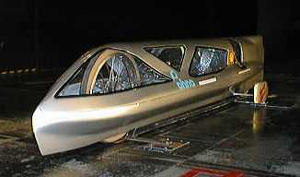 We can use the wind tunnel which is in miyoshi-city Hiroshima Japan. This photograph show the testing of '96 cray model. We tested the '97 model in wind tunnel. This car body is same to '97 Fancy Carol. We studied the air flow using woolen yarn and measured air flow resistance. It is good for cultivate the sense of air flow dynamics to study the air flow. We confirmed low air flow resistance of this car. And we test some new items to lower air flow resistance.